Apart from effective Maths and Science tuition Go for Gold provides, a huge element that renders our programme so successful is our Leadership Development training. The Leadership Development training provides students with the necessary soft skills required to integrate well in life and in the world of work. We are so happy they enjoyed the visit and see that their funding is being put to great use. 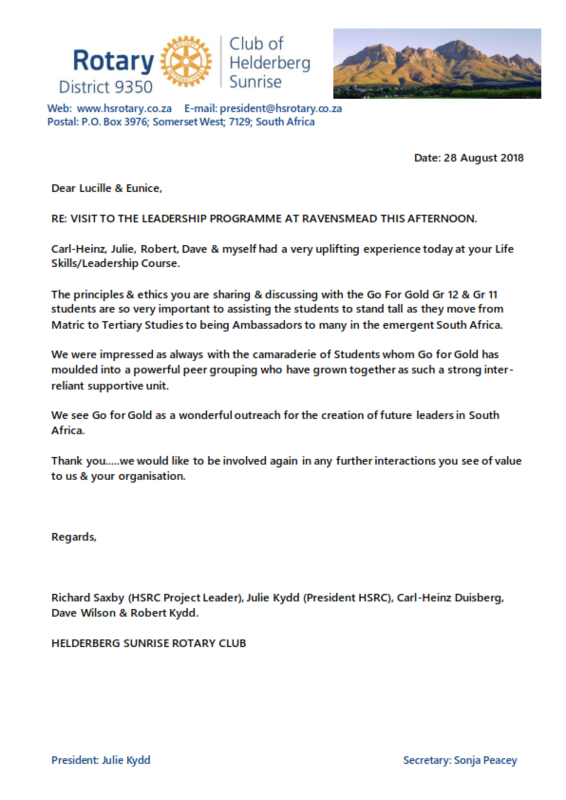 Thank you Helderberg Sunrise Rotary for your continued support. Go for Gold offer our Leadership Development training as an elective module at Tjeka Training Academy and the Academy of Construction Skills. Our partner companies incorporate this module to aid in their personnel’s individual development.